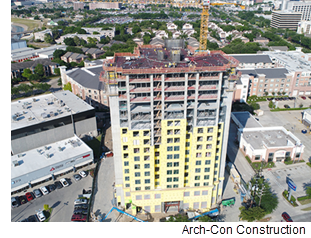 ​​​ HOUSTON – The 16-story Residence Inn Medical Center topped out May 2018, seven months after breaking ground. Located at 7807 Kirby Dr., the 128-room hotel will have an indoor pool, fitness center, with kitchens and appliances in every room. The project also includes a 70,000-sf parking garage. The development is on target to open in February 2019.